If there is a look that a person has when they’re glad they’re not running for president, Scott Walker has it. 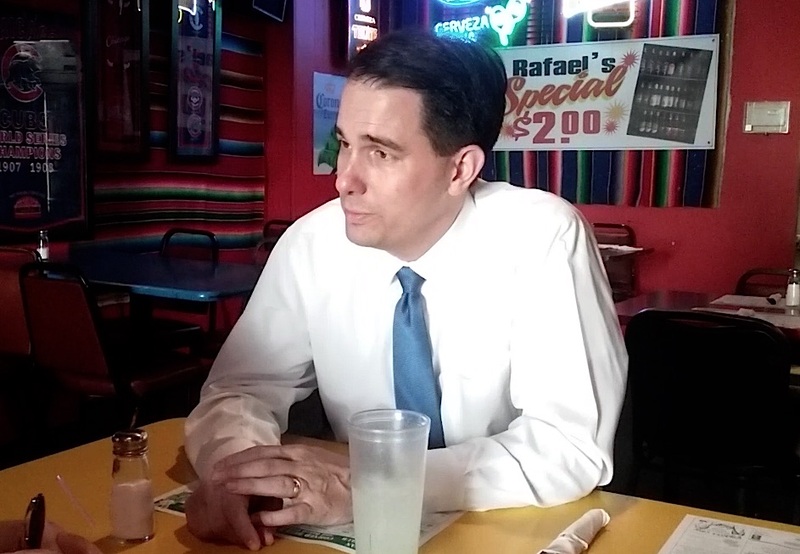 I spoke with Walker Tuesday at Hernandez restaurant in Delavan, the town in which the governor grew up. I was interviewing him for a column I was writing for Walworth County Sunday, where I work as editor. I wanted to hear what he thought about the Republican race and how it had evolved since he dropped out. I also wanted to know if he still was confident in the direction of the state, even as his critics remain vocal and determined. “Do you mind if I do a video of the interview for our website?” I asked the governor. “No, actually I record them too,” he said. It’s his cynical reaction after being on the national campaign trail. “How did they get that out of what I said,” Walker said he often thought. It’s clear that Walker doesn’t regret getting out of the presidential race. In fact the only regret he shared about his foray into presidential politics is signing the pledge early in his campaign to support the Republican nominee, no matter who it is. “I hope I don’t have to get into that,” he said. Walker said he thinks after the most recent primaries that there might be a chance another nominee could emerge besides Donald Trump or that there could be an open convention. For Walker, the biggest issue is the national debt, yet it never comes up during the debates. Walker is looking forward and in his community listening sessions he’s asking residents to imagine what kind of state they would like to live in 20 years from now. But in some ways, Walker has distanced himself from the state we live in today. After corralling his party to toe the line five years ago to enact the controversial Act 10, which in effect eliminated public employee unions in the state while shifting a significant portion of retirement expense onto employees, Walker has stayed out of the public debates coming out of Madison at the end of the most recent session. That isn’t to say he hasn’t signed any of the Republican majority’s bills — he has. But Walker says his focus is on economic development. “I say, particularly with some of these other hot button (bills) if it’s not helping me create jobs or fill jobs I’m not focused on it,” he said. Much of his work on the jobs front no longer comes through legislation, Walker said, but by shifting resources administratively. Walker agreed that unemployment isn’t the issue it once was. And he acknowledged that even though traditional Republican priorities are reducing taxes and regulations on businesses, most small business owners are interested in two things — more customers and being able to hire qualified employees. Both issues connect to wage growth, however Walker downplayed the impact that state government could have on wages. “There’s not a whole lot we can do,” he said. He shared an anecdote about talking to employers who can’t expand because they can’t find qualified employees, and in Wisconsin, the workforce actually is shrinking, according to some statistics. “The challenge now, even more than it ever was, with the aging population, is that we need to find more workers,” Walker said. Among his initiatives have been middle school funding for academic and career plans, funding for dual enrollment with technical colleges as well as working with the UW system on a three-year degree plan for hard-to-fill positions. Despite large givebacks by public employees after Act 10, school districts and municipalities continue to struggle with their budgets. Although his critics say that what Walker calls reforms actually are hurting the state, Walker isn’t buying it. He also points to fourth- and eighth-grade reading scores being up and graduation rates in all demographics higher than they were a year ago. After the next budget, which includes controversial changes to state employee health insurance, Walker said his plan is to funnel those savings into education. After that budget is done, Walker says he’ll turn his attention to running for re-election in 2018.